Madonna dell-Oliva is extra-virgin artisan olive oil, and can only be found in one place. Nestled in the rolling hills just north of Florence, the five-hundred-year-old Villa Lucia ’s olive trees are nurtured in the lavish golden warmth of the Tuscan sun. This private and organically-operated property in Montevettolini, Italy is known as the “Nursery of Europe,” and is popular for its artisans as well as hand-crafted, traditional foods. Proprietor Lucia personally oversees the acres of Frantoio, Leccio and Pentolino olive trees, managing the yearly growth, harvest and blending of the olives, which result in this world-class olive oil. Harvested by hand, at the perfect moment of ripeness, these special olives are swiftly brought to a processing facility mere minutes away. They are then put into stainless steel containers to maintain taste, aroma and a higher percentage of phenolic antioxidants, by decreasing oxidation. The percentage of free acidity is an excellent measure of the care taken when processing olive oil. The International Olive Oil Counsel’s labeling standard for extra virgin oil is .8% free acidity or less. Villa Lucia olive oil has consistently tested at .1% acidity, excellent by any standard. Olive oil with extremely low acidity contains the highest levels of antioxidants and anti-inflammatory concentrations, and is nutritionally superior to oil with a higher free acidity percentage. 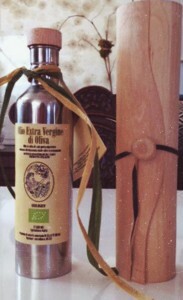 Madonna dell’Oliva is condiment oil, meant to enhance your foods after cooking. By using it raw, our oil’s exceptional flavor and nutritional qualities are preserved in flavor. Try it drizzled over pasta, salad, cooked greens, or brushed on a crostini. Explore the many ways to enjoy our unique olive oil, and let us know if you come up with one we’ve never tried! Ask us about Olive Oil School during Harvest season in October & November!